My 13-year old daughter never ceases to amaze me. She does anything she sets her mind to. A few weeks ago she decided she wanted to make eggs benedict for breakfast. I thought about trying to talk her out of it. It is after all a very challenging and fairly labor intensive meal to make and she hasn’t spent a lot of time in the kitchen. But I stopped myself. With her can do attitude, I knew she’d managed to do alright. And she did more than alright. She rocked it! What a delicious breakfast. 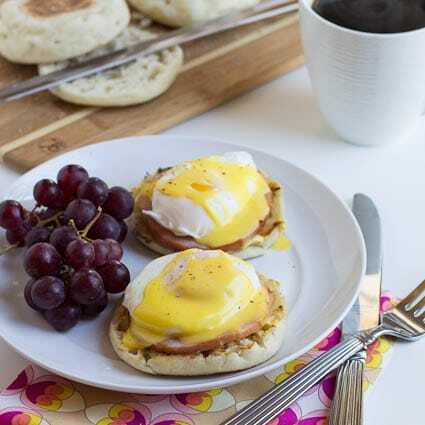 Eggs Benedict has to be one of my favorite meals ever. Rich and creamy with lots of protein. Breakfast doesn’t get any better than this. Especially when someone else makes it for you. My daughter watched this video to learn how to make it. And it must be a pretty good video because my daughter’s Eggs Benedict were flawless. For the Hollandaise Sauce: Fill a saucepan with 1 inch water and bring to a simmer. Turn heat to low. Fill a 12-inch skillet with high sides halfway with water. Add vinegar and bring to a simmer. In a glass bowl, whisk together egg yolks and lemon juice until they double in size and become pale. Should take about 2 minutes. Place bowl with egg mixture on top of the saucepan and continue to whisk while gradually adding the butter a little at a time. Continue to whisk over the simmering heat until sauce thickens. Once sauce has thickened, remove sauce from heat and stir in cayenne pepper and salt to taste. Set aside. Save some of the simmering water in case the sauce needs to be thinned before serving. Break each egg in a small bowl and drop 1 at a time into the simmering water in the skillet. Cook for about 3 minutes. Remove with a slotted spoon and place on a plate lined with paper towels. Keep the water simmering in case you need to reheat the eggs. You can briefly put them back in the water. In a nonstick skillet or griddle pan, brown Canadian bacon on both sides. Spread a little butter on each English muffin and place cut side down on skillet to toast. 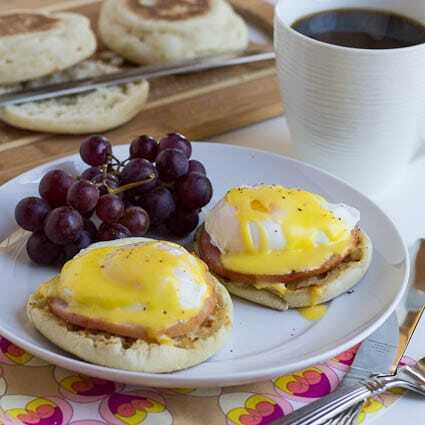 To assemble, top each English muffin half with a Canadian bacon slice, place an egg on top, and drizzle with some Hollandaise Sauce. 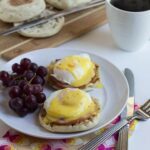 This entry was posted in Breakfast and tagged Breakfast, eggs, eggs benedict. Bookmark the permalink. 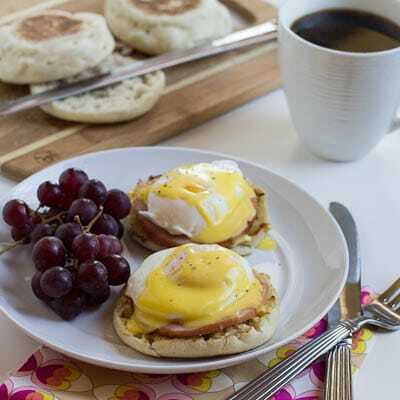 Gorgeous eggs benedict! Perfect Sunday breakfast! Your daughter is very talented and her cooking abilities are way beyond her age. I just wish she would cook more often! Love me some sunny side up eggs! Would you believe I’ve NEVER eaten eggs benedict?? I can’t believe your daughter made those!! So cool! !